Score one for blogging. Yesterday I had a real life feel good moment as a direct result of my blog. I met Spuz. Spuz reads my blog. She read it while living in New Jersey and has since moved to the Linville area to live near family. 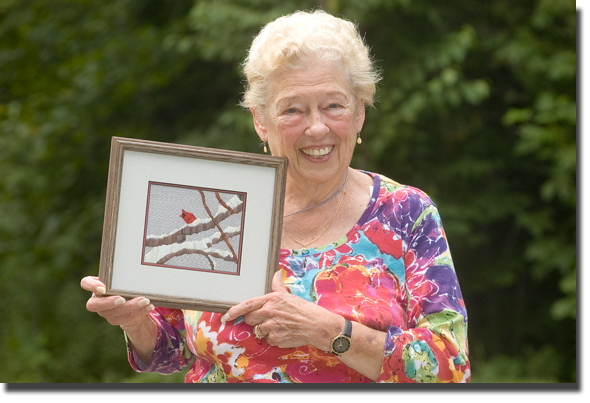 She called me because she wanted to show me some of her embroidery work and ask my permission to enter a work of hers, borrowed from one of my photos, in the Avery County fair. We got acquainted over unsweetened ice tea at the Famous Louise's Rockhouse. Next she invited me to her new home. Spuz weaves magic via needle and thread. Truly, her work needs to be seen up close to appreciate it. From samplers to complex pieces she is a master artist. But she's way too humble to admit it. When I asked her about each piece hanging on the walls of her home, I noticed how she associated each work with a period of time in her life. There are stories behind each one of her pieces and I get that. Finally I asked Spuz about her name. "When I was born, the term 'spuzzy' was a fashionable word for something neat and special. I was the first child, thus earned the name 'Spuz'." Sweet and such a fitting moniker for her. I left her home driving back to Boone feeling spuzzy all over. P.S.- If you go to the Avery County fair be sure to look for Spuz's work and then comment VERY loudly how you like her work. We're working for a blue ribbon here people.